The software is simplified third-party tool, which is specially designed to recover corrupted or damaged SharePoint database MDF files. A user can recover the whole SharePoint databases efficiently with the help of this software. 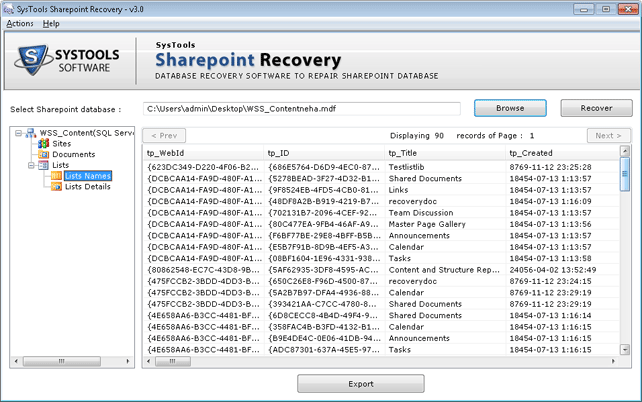 Restore SharePoint databases Functions, Lists, Triggers, Rules, Documents, etc. 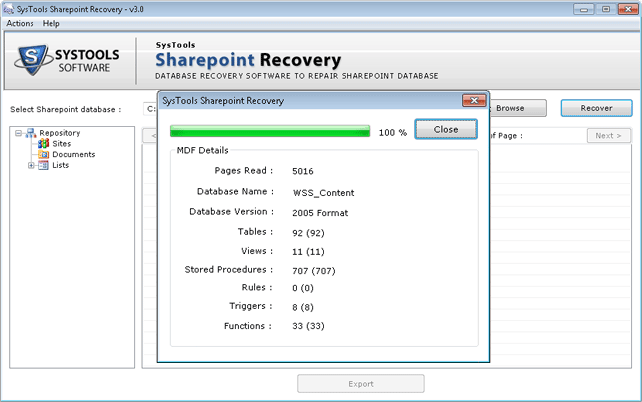 SharePoint repair tool allows users to repair corrupted or damaged SharePoint database MDF files. This tool can recover all the documents, lists, sites, metadata, custom views, Web chart links, etc. present in the SharePoint database. It is effectively recover sharepoint files data. 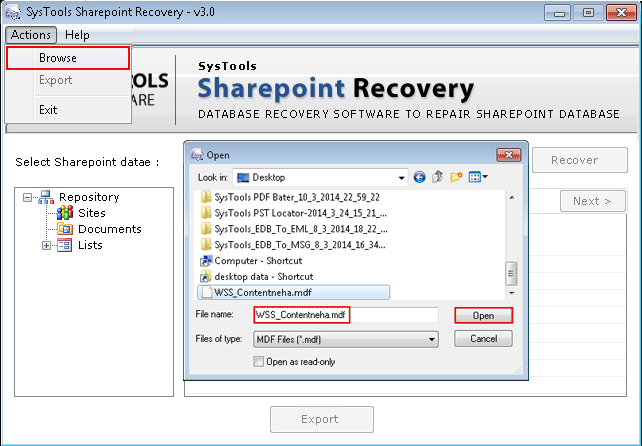 This Recovery tool performs quick scanning of the SharePoint files to recover corrupted or damaged SharePoint database files. After scanning, it generates an instant preview of all the items of MDF files with their associated attributes. SharePoint Restore tool allows users to export selective items from recovered SharePoint database instead of exporting of the whole data of the databases. A user can use this feature by check or uncheck those items, which they want to or do not want to export from the recovered SharePoint database. 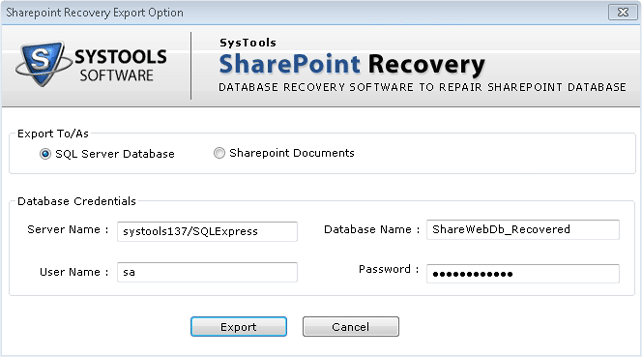 After recovery of SharePoint database, The software provides two options to export recovered items. These two options are: Save In SQL Server Database: The user can export SharePoint database into SQL server and to do this, there is a need of SQL server credentials. Extract SharePoint Documents: This tool provides an option to save all SharePoint documents in a new MDF files. Is there any file size limitation on the SharePoint MDF file? “I have a large size damaged SharePoint MDF file and I want to repair that damaged SharePoint file using SharePoint Repair software. So, I want to know, is there any database size limitation on the SharePoint database?" No, there is no file size limitation on the SharePoint MDF file. A user can recover corrupted or damaged SharePoint database of any size. Q. 2. Is the trial version of sharepoint repair tool available? Yes, the trial version of SharePoint rstore Tool is available on the official website. However, the free version of this tool has a limitation that it cannot export recovered SharePoint database. Q. 3. Can I export selective items from SharePoint database using this tool? “I have so many items in my SharePoint database but only some items in it are important for me. So, I want to export only a few items from it. So, I want to know, will SharePoint data retrival tool allow me to export only selective items?" 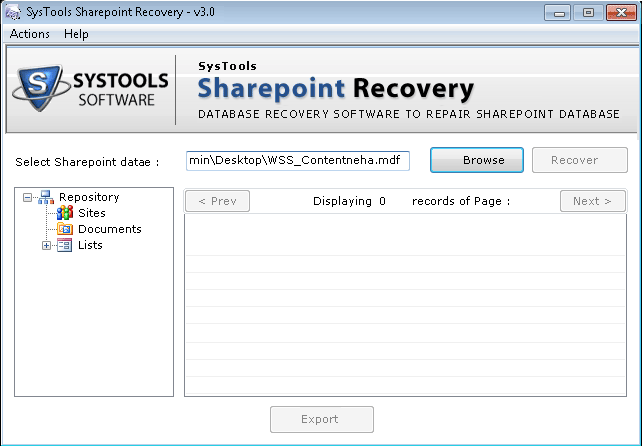 Yes, you can export only selective items from SharePoint database using SharePoint file Recovery Tool. 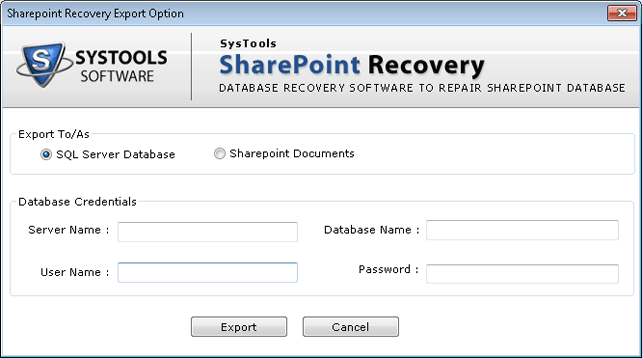 How to Recover SharePoint Database with tool? 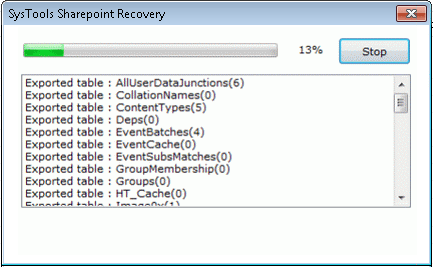 Step 3 : Click on the “Recover” button to start the recovery process of sharepoint MDF Recovery.Open option. Step 4 : After that you can see the status in the displayed screen. Step 5 : MDF file repair tool will display the list of the repaired MDF file Document. Step 6 : Click the Export option to save the repaired SharePoint MDF file. Open SQL Server Management Studio, New Database, Options, Collation, Select ‘Latin1_General_CI_AS_KS_WS’. Enter the Name of Server, Database, User, Password . 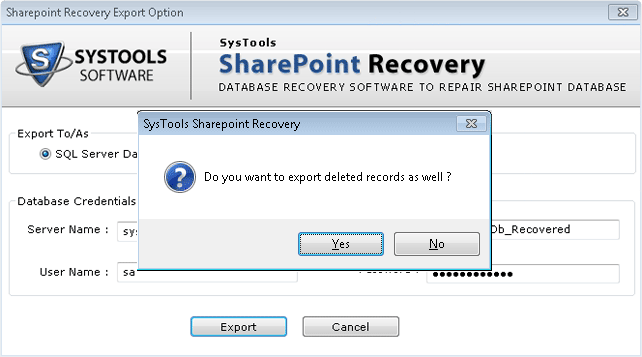 Step 8 : Message will appear “Do you want to export deleted record as well select Yes or No”. 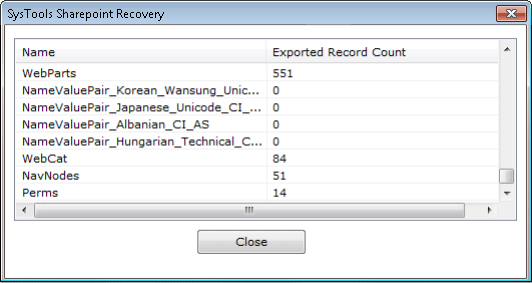 Step 9 : The Tool shows export sharepoint data recovery progress report live. Step 10 : After successful completion of Export MDF file process you will see the exported number of records and tables name.